Christmas Trees: Live or Artificial? The classic holiday debate, unwrapped. 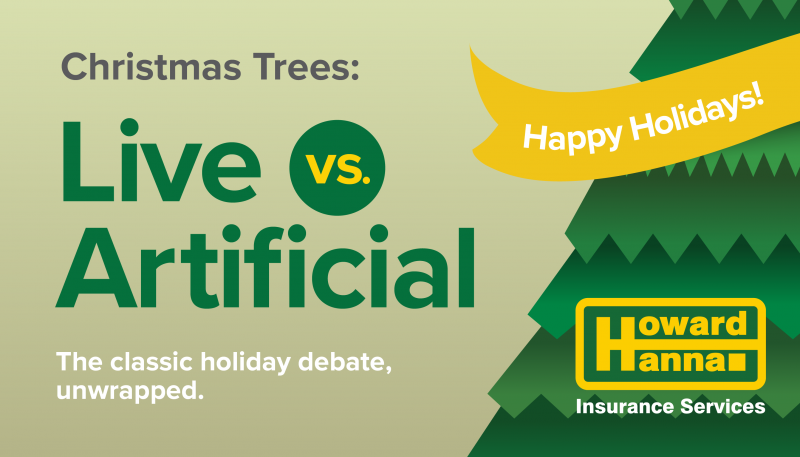 When it comes to Christmas trees, do you choose live or artificial? Both have their advantages and disadvantages, and we here at Howard Hanna Insurance Services certainly aren’t going to try to convince you that either one is “right.” But in the spirit of giving, we thought we’d provide some information to help you make the best decision for you and your family. Artificial trees: According to the North Carolina Consumers Council, artificial trees pose fewer safety concerns than live trees, but that’s not to say they don’t have risks of their own. Even fake trees can catch fire when sockets are overloaded with Christmas lights, and it only takes seconds for any tree to become completely engulfed in flames. Even flame-resistant artificial trees will eventually succumb to a fire. When using a pre-lit tree, always follow instructions, and place the tree in an open area where a fire won’t quickly spread to furniture or other things nearby. Live trees: OK, so you want the real deal. That’s great! But you’re going to have to take a little more care than you would with an artificial tree. First of all, pick a tree that’s in good shape. If needles come off easily when you give it a shake or a quick pull on a branch, find another one. When you get it home, cut off the bottom two inches of its trunk, and fill the tree stand with water regularly. This is the best way to prevent a fire. Remember not to overload it with lights and decorations. And the longer you keep your tree up, the drier — and the more dangerous – it will become. Dispose of your tree properly as well. Don’t burn it or put it in your fireplace, as a burning Christmas tree can be harder to control than other types of fires. If you’re a fan of real trees, you probably don’t need us to tell you the benefits. Just take in that smell and enjoy the season! What a GREAT blog… Trees. Artificial or Real… I’ve chosen both through the years and although I have a tiny pet, who just loved to (seriously) “head-long dive” into both, I know that I love to view others tree BIG TIME…(I am sure you can understand why). I love this article because it offers guidance for and to both styles of trees. Now, I have a 2 foot Swarovski crystal tree, and “the pet” only stares into it, no leaping, jumping, moving, playing, eating what-so-ever and I am so glad to have a tree. No matter the style I am thankful for this article of guidance and the memories of fun… me and my family have had through the years with “THE Christmas Tree”. Pixar should do a movie about the Christmas Trees, call it “Evergreen Land” The Christmas story of Christmas Trees and their journey to your home… wouldn’t that be FUN Thank you. ?